This weekend was good fun. I went to Pilates on Saturday morning again. It was once again brilliant. It’s tough but in a completely different way, you know? I tried out the Hundred move this week so I was chuffed as that’s the only Pilates move I’d heard of! And it was tough. I think I struggle mostly with the technical aspects of inhaling/exhaling at the appropriate moments and making sure my spine is where it should be while tensing my stomach…It hurts my muscles and my head! I decided to run there as it’s only 1.5 miles away. Well, it’s only 1.5 miles if you don’t get lost that is. I thought I was being all cunning by taking a short-cut. I was so sure of where I would end up after going down this long, long road. Only to find I’d added another mile on to my journey! It meant my lovely leisurely paced run turned into a fast dash as I was in danger of being late. Whoops. On Saturday evening we went round our friend’s house for a murder mystery evening. It was brilliant. Everyone got into their character that they’d been set and we just had such a good laugh. It was a 1920s theme which was brilliant. All the girls in their flapper dresses and all the guys in there suspenders and hats. Then on Sunday Ben and I went skiing at our local dry sky-slope with some friends. It was great fun as I’m beginning to learn parallel turns. OK not very well but I’m getting there! And I didn’t fall over which, considering I’m the most clumsy person known to man, is a great accomplishment. So it’s the last WIAW for October. Thank you Jenn for hosting (check out her blog for more information). This is my what I ate Sunday as it’s probably my most exciting eats. Breakfast: Sundays are pancakes day. It just seems like such a perfect day to spend that extra effort into creating something that is quite magical. 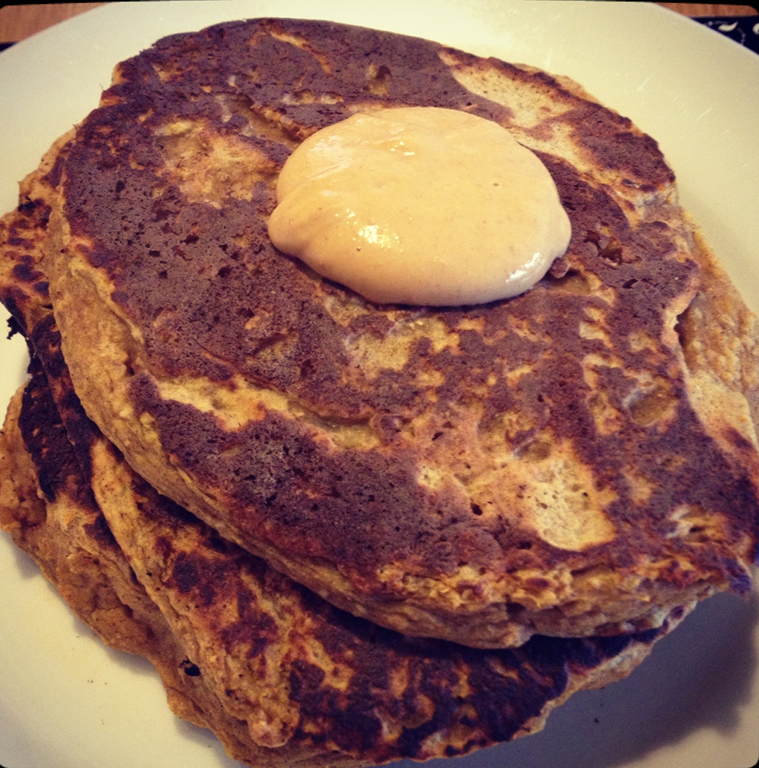 Pumpkin pancakes! I know, I know, how original. Almost getting as boring as my green porridge… But I made my own pumpkin puree from a mammoth of a pumpkin so I’m really chuffed with these (on a slightly related note – I now have so much pumpkin I’m set for the next few years! Ben thinks I’m more crazy). It was amazing. I used 3 tbs rolled oats, 1 heaped tbs of wholemeal flour, 1/2 cup of egg whites, 1/2 cup of pumpkin puree, 1 tsp baking powder, 1 tsp cinnamon, 1 tsp pumpkin spice, few drops of Stevia. I got three chunky pancakes out of that. Then some peanut butter thrown on top. Lunch: after skiing we were famished and wanted to grab something quick. So I made a three egg omelette with more peanut butter inside. And some avocado alongside. OK it does look like the omelette and avocado aren’t speaking at the moment. Maybe a smaller plate would have been better… Regardless though I love this. Why haven’t I ever had this combination before? The avocado addition I could take or leave to be honest but the omelette itself was so good. And very filling. A nice change from my usual tuna omelette. Dinner: as you know, I love my salads. They rock my world. And this was a new combination. My usual salad of leaves, cucumber, beets but with some fabulous added extras. I added some roasted pumpkin (like I said, I have so much pumpkin at the moment it’s laughable). I also finely chopped some red onion, sliced cherry tomatoes and pomegranate seeds and mixed them with diced garlic and lemon juice. Then I topped it all with a chunk of grilled halloumi. I’m new to this cheese and though it’s verrrry rubbery it really is very tasty. The sweet (pomegranate, tomatoes) and salty (cheese) of this salad were perfect. Oh and I sprinkled some pumpkin seeds on top too. Mega variety salad. Definitely going to happen again some time! Snacks: Completely out of the ordinary, I did some baking on Monday night. Usually anything I bake turns out rubbish or looks nothing like the recipe picture. In some shape or form I do something wrong. I’m better at throwing things together randomly rather than accurately following a recipe…HOWEVER! These cookies turned out exactly like the photo. Fitness: Obviously Pilates on Saturday. And I’ve been sticking to my new strength routine which has been really good but quite tough. I did the upper body routine on Thursday and the lower body on Friday and basically woke up feeling verrry achy on Saturday morning. Perfect for Pilates…whoops. And I’ve been running three times a week as usual. I’m enjoying running at lunchtimes far more than dragging myself out of bed in the morning. Though it’s harder to motivate myself when my lunch is sat there waiting for me…but no quitting yet! And it feels great coming back into the office after a run. I don’t feel the afternoon dip. Scarf from mum, jeans from Top Shop, top from Dorothy Perkins, necklace from Mango. That’s all from me! Hope you’re having a great Wednesday. How are you celebrating Halloween? Any scary treats to enjoy? There is no shame in eating as much pumpkin as possible right now, we might as well before the fall month end and then it becomes less socially acceptable to gorge ourselves with pumpkin! I love your massive dinner salad, the more you can cram into a salad, the better it is in my opinion! Haha, yes totally agree about the salad. More is definitely better. This post has so many fantastic components; I’m not sure where to begin! First, I LOVE your murder mystery costume—it’s 1920’s perfection! Those parties are so much fun…In college I attended a few, each with a completely different theme. I’d completely forgotten about them until tonight. I’d love to host one myself sometime! All of your eats look absolutely delicious–especially your halloumi and pomegranate salad. Yum! Oh the party was so much fun. I do loved themed parties, especially when everyone gets involved. I’m not sure if dry ski slopes are rare or not in Britain. All I know is we have one very close to us! There’s a ‘fake’ ski slope a few hours from us where there’s actual fake snow which sounds quite fun. The cold didn’t bother me too much as you’re doing so much moving that you don’t notice it. But we’ll see with actual snow soon!! Oh I’m loving all of your meals. I mean look @ all that peanut butter.. DELICIOUS! Hehe thanks, it was prtty awesome. I used to ski when I was younger, although I was just up to parallel turns- I was very nervous! We had dry slope lessons, but then went to France a few times, and once to Boston. Skiiing on snow is so much easier and gentler than the dry slopes, so I am sure you will have a fab time 🙂 Andy got some lessons for his birthday, and we are going to California next Easter, and he fancies having a day skiiing while we are out there, so I might have to have a few lessons to brush up, as I don’t think I have been for about 10 years! Wow skiing in Boston sounds amazing – as does California! Yeah they say it’s easier in actual snow so I’m hoping I will just get on and get better out there. I’d hate to feel rubbish for an entire holiday hehe. Well it’ll be a laugh I guess! Love the costume! I was also a flapper the one night I went out for halloween last weekend!! I don’t blame you either for all the pumpkin you have been eating!! I LOVE it! Your pumpkin pancakes look sooo good. I need to make some this weekend, I have a ton of pumpkin left that is calling my name to be made into something delicious! Ahh brilliant! Flapper costumes are great. I love the feathers and sequins hehe. I love how versatile pumpkin is, no worry of throwing it away unused! First of all, your costume is amazing! You look so pretty. I love the idea of a murder mystery party. Second. WHOA. Hold up- You can ski on “dry” slopes? I wish I had some of those near me! I haven’t been skiing in forever because of the price. But that looks like a lot of fun. Yeah it was quite a bargain, half a day for £15! And they have lessons as well. Such a good idea and so much fun. Your halloween costume is the cutest I’ve seen! Love it! !